Traditionally, by reporting on gross domestic product – the amount an economy produces of goods like cars and services like tourism. But, since the financial crisis that measure has been questioned. It can go up – showing growth – while at the same time people’s actual incomes are going down. Which has left people wondering if the economy is really working for them. Another way to measure economic success was launched today by the World Bank. 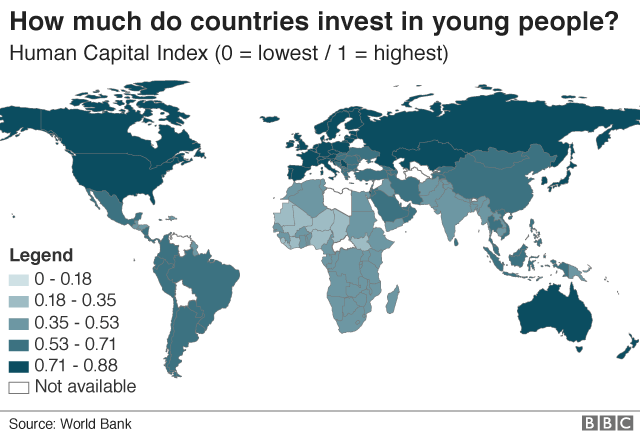 Its Human Capital Index ranks countries according to how much is invested in young people. The higher the investment in education and health the more productive and higher earning the workforce tends to be, the World Bank says. Which leads to the creation of higher levels of wealth and a stronger economy. Its rankings reveal that Asian countries dominate the top positions. First is Singapore, followed by South Korea, Japan and Hong Kong. Finland and Ireland are fifth and sixth, with the UK in 15th place, below Germany but ahead of France, Norway and Switzerland. The bottom of the list is dominated by countries in Africa, where human capital scores are a third of those enjoyed by leading nations. For 157 countries the World Bank studied the quantity and quality of education provided to children, the mortality rate for under-5s, the “rate of stunting” among young people (a measure of how healthy children are) and the chances of someone living to 60 by the time they reach 15-years-of-age (the “adult survival rate”). What is striking is that even a country with a relatively high score like the UK could still achieve 22% more wealth from its workforce if it improved its focus on health, education and skills training among the young. A country with a score of 0.5 – for example, Tunisia and Kenya – could potentially double wealth creation. 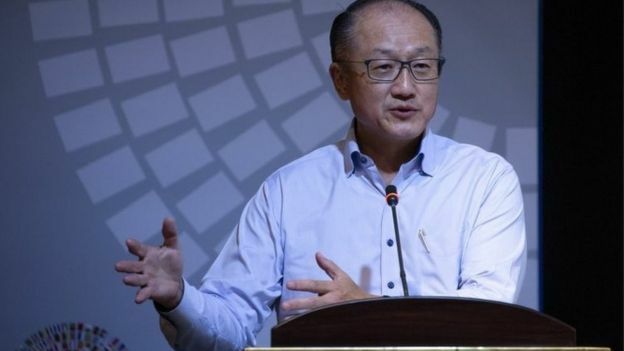 Dr Jim Kim, the president of the World Bank, said that countries needed to “invest more, and more effectively, in their people”. It wasn’t always the quantity of investment that was important, the quality was as well, he said – pointing out that some countries, rather than taking responsibility, had been “waiting for donations [to help education and health schemes] rather than taking it seriously”. Dr Kim said there was a danger of nations being too supply driven – putting more money into health and education schemes – rather than output driven – seeing what works and focusing on successful policies. He said that some countries like South Korea spent lower amounts on education as a proportion of their overall income, but still beat higher spending countries on outcome scores. “Human capital consists of the knowledge, skills and health that people accumulate over their lives, enabling them to realize their potential as productive members of society,” the World Bank report, published at the IMF annual meeting in Bali, said. The report points out that during periods dominated by technological change, such as now with the growth of artificial intelligence, investment in “human capital” and problem solving skills is particularly important. “For individuals, an additional year of school generates higher earnings on average,” the report says. “These returns are large in low and middle-income countries, especially for women. 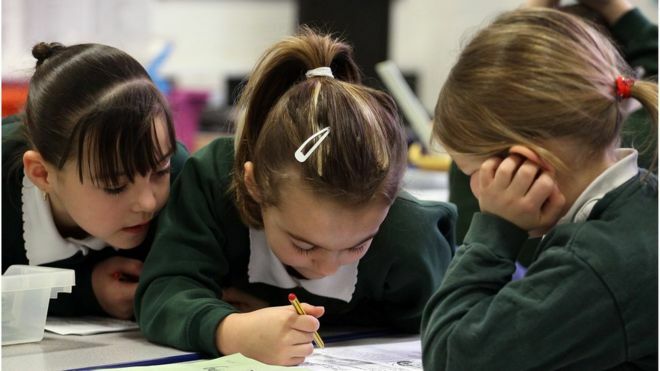 “What children learn matters more than how long they stay in school. The report points out how some governments are keen to invest in projects that are quickly visible to voters, such as motorways, rather than think longer term. But it points out that with policies sustained over a number of decades progress can be made. In 1950, the average adult in Singapore had completed just two years of education. Now the country has some of the best education results in the world and is top of the first Human Capital Index. This entry was posted on Sunday, October 21st, 2018. You can follow any responses to this entry through the RSS 2.0 feed. You can skip to the end and leave a response.